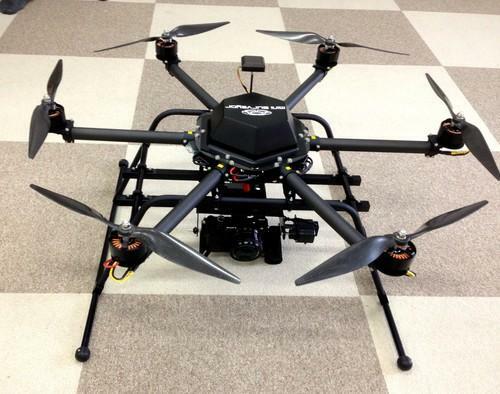 The Mini Surveyor, developed by a Chiba University spinoff, is the first mass-produced hexacopter drone in Japan. It will be used to help map radiation at the crippled Fukushima Dai-Ichi nuclear power plant. But when it comes to drones, Japan is almost a nonentity in a rapidly growing market. The odd made-in-Japan drones show up at tech trade shows in Tokyo, but these are usually for research purposes and are exhibited by small startups or university groups. The absence of drones is puzzling, given that Japan has the electronics know-how and vast camera and video markets, which drones have entered overseas. The earthquake and tsunami that destroyed the Fukushima Dai-Ichi nuclear power plant four years ago, however, are helping open a path for Japan to bring its technological expertise to drone innovation. Deployed by Japan's atomic and space agencies, drones have been used as experimental sensors to measure radiation levels at the contaminated site. Drone enthusiasts have also captured stunning aerial views of the region. And Fukushima Prefecture is now slated to host the country's first mass production of hexacopter, or six-rotor, drones. A spin-off of Chiba University, Autonomous Control Systems Laboratory, plans to mass produce the high-end hexacopter that will initially help cleanup crews by performing radiation surveys of the crippled complex. Armed with a laser scanner to help navigate, the 90 centimeter-diameter drone has a top speed of 10 meters per second and can carry a payload of 6 kilograms including radiation detectors and a battery. The startup recently celebrated the machine's maiden flight in Fukushima, and plans to turn out 400 units in its first production run. "These drones will be able to perform free autonomous flight in a non-GPS environment," said Kenzo Nonami, a Chiba University robotics professor heading the startup. With a price between ¥2 million (US$16,500) and ¥3 million, the machines are far from being affordable consumer drones. But they will be targeted at companies doing aerial video and photography, one of the most popular consumer apps for drones, and could be a step toward a domestic consumer drone industry. Large Japanese manufacturers such as Yamaha Motor, NEC and Fuji Heavy Industries, on the other hand, are developing unmanned aerial vehicles (UAVs) for industry, surveillance and research, but they've shown little interest in consumer drones. For decades, Yamaha has produced powerful gasoline-engine unmanned helicopters with 30kg payloads for agricultural use, but it has no plans for consumer applications, a company spokesman said. One problem holding back drones is that Japan lacks laws that can apply to the recent drone boom. The only applicable regulations state that vehicles must fly under 150m and remain at least 9km from airports. "The government is considering new regulations but it takes a long time," said Shinji Suzuki, director of the Center of Aviation Innovation Research at the University of Tokyo, which uses Yamaha's helicopters to survey the magnetic fields of volcanoes. Suzuki's lab has been researching autonomous navigation abilities for drones, and the Fukushima disaster influenced how lab member Chris Raabe formulated his research. "I was very much motivated to develop a sensor that would enable a drone to enter and explore a damaged facility," Raabe said via email. "However, I later found that typical digital cameras are easily affected by radiation." Raabe has worked with colleagues at Sweden's Royal Institute of Technology and Boeing in the U.S. to develop a hexacopter system that navigates by computer vision instead of the common method of GPS and digital compass. The system orients by tracking landmarks in the environment, and while it has problems with moving objects and shadows, it could be configured to be 10 to 100 times more precise than systems using GPS, Raabe said. To help drive new drone technology, Suzuki is serving as head of the Japan UAS Industrial Development Association (JUIDA), a group of about 100 companies and people focused on proposing regulations for the nonprofit use of drones in Japan. With plans to publish draft rules this summer, it's coordinating with government ministries on issues such as pilot licensing and drone safety, manufacturing and radio transmissions. Regulations for commercial drones, such as those recently put forth by the U.S. Federal Aviation Administration and Department of Transportation, are farther off. Another reason that Japan is playing catch-up in drones is the state of its commercial aviation industry. In World War II, Mitsubishi Heavy Industries' Zero fighter was renowned for maneuverability in dogfighting. But aircraft production and training went into rapid decline under the postwar Allied Occupation, Suzuki noted. This year, Mitsubishi, which has long made parts for Boeing jetliners, is slated to begin trial flights of a regional jet that will become the first full-scale Japanese commercial aircraft in about 40 years. Meanwhile, Honda Motor's HondaJet, a small business jet, is entering service in 2015. This renaissance in Japanese aviation is giving domestic drones a shot in the arm. The government's Robot Revolution Realization Committee wants to overhaul laws that may hinder drone development. The state also wants to designate testing areas with little regulation to spur drone development. An international drone expo is also planned for May outside Tokyo. "In Japan, it may be too late to enter the drone manufacturing industry as there are large manufacturers in the United States and China, but we are developing sensors and application software, so that's one possible way to find a market," Suzuki said.